Rage XBox 360 Review In the end, iD have come back with gusto and their latest game Rage is definitely a keeper. The path of humanity is not looking bright, especially in the world of gaming where post apocalyptic futures seem to be the... rage. 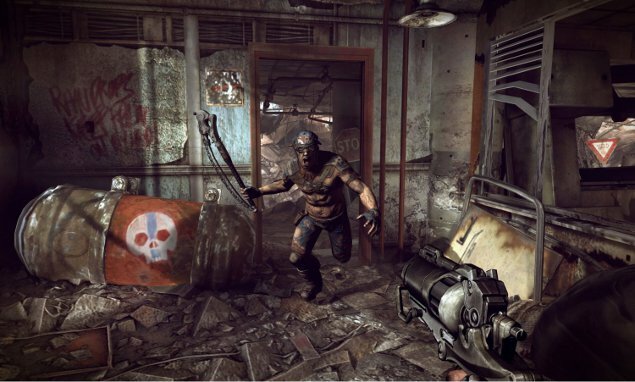 Rage... that's the latest game from developers iD who have been responsible for some of the most defining moments on the PC with Doom and Quake. Needless to say, both these games were set in futures that were quite disturbing and Rage meets this criteria perfectly. Apart from the clichéd story of an asteroid decimating Earth (albeit fun). From its ashes, a Mad Max inspired post apocalyptic world is born but best of all, the gameplay is oozing with iD analogies which in our books, is definitely a step in the right direction for an award winning game. As soon as you step into this desert world, the first thing that hits you is the realism of your surroundings and I swear, it feels like you could kick the ground and the dust would rise. From the realistic landscapes to the badly damaged cities and cityscapes, Earth has definitely seen better days. The only issue with the gaming environment is that although it may seem open world, the game does put a limitation on where and what your character can access. However through its careful use of smoke and mirrors, the illusion works, especially when dealing with NPC's with their colourful stories and more importantly, the quests that they give your character. As mentioned, Rage has "iDisms" littered through the game so if you have played Quake or Doom, you pretty much know what to expect. iD have also streamlined the gaming engine and as opposed to a convoluted cover system or useless animations that get repetitive, they have created a streamlined gaming experience that just feels perfect. 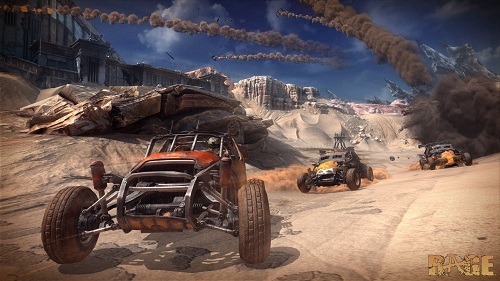 Unlike other first person shooters, Rage has incorporated post apocalyptic vehicles into the game which don't just feel like a quick addition but rather, it compliments the overall gameplay. Some missions require you to use vehicles and for the most part, vehicles are used from traversing this beautiful environment from A to B. More importantly, vehicles are also used to give the player a break from main gameplay through the inclusion of races. Mad Max indeed! After the montage of teasers and trailers that we have seen on the internet, the real-world asteroid Aphosis which is actually headed towards Earth is the catalyst for this story, however "our" scientists have calculated that this will just miss our planet. However in the world of Rage, Earth and Aphosis are on a collision course. However, before this decimation occurs, the government have chosen a group of people to be sealed under the Earth in order to help rebuild the world. Unfortunately for you, your cryogenic sleep goes a little longer then expected and many of your colleagues have died within their status pods of this ark. Upon waking in this new brave world, confused and shattered, you are soon inducted into this violent world and your bacon is saved by a local who takes you under his wing and gives you a run down of what has happened since Aphosis. Thus begins your journey as you explore this post apocalyptic world born out of the ashes of Aphosis while you engage in a variety of quests for Wastelanders in order to keep a sense of stability and more importantly, order. Given that, NPC's play an integral role to the story and each one you encounter has their own stories and motivations which all linked to a bigger picture. From Doctors to engineers and ladies of the night, the characters are very diverse and colour. Apart from exploring, driving and completing quests for NPC's, combat is the heart of Rage. Depending on your difficulty, the AI can be quite clever at times as they use the environment to gain the advantage or try to lure you into the open to take you out sniper style. There are plenty of guns available to the player, however these must earned. You cannot just kill your opponent and take their weapons because once you kill an enemy, they vanish "old school" and so does their gun. 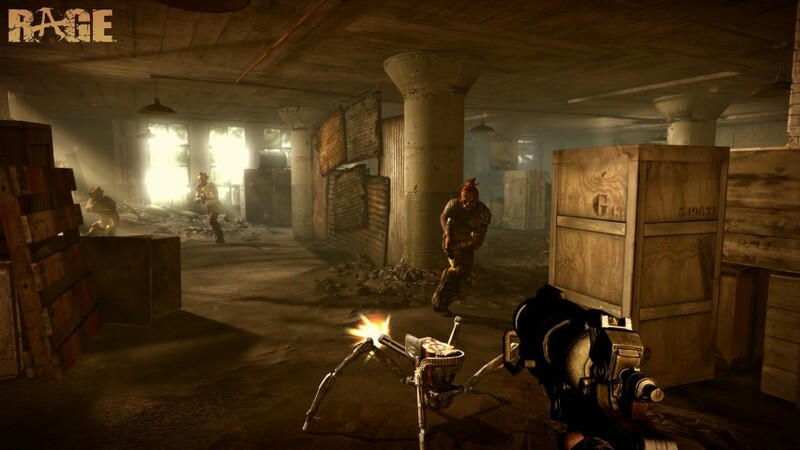 The majority of weapons have this Earthy and rough feeling to them which coincides with the story nicely but more importantly as this world is built on a dead civilization, you have some great options of upgrading your weapons such as your trusty handgun which can really pack a punch once it's suited out such as configuring it to hold explosive rounds or even a sniper scope. The most complex element of combat is the target system because you can aim at certain parts of the body such as limbs or for those purists... head shots. If you do manage to successfully wound a bandit or mutant, they can sometimes continue crawling or still shoot at you, so you do need to be careful. Given that, all enemies can take a fair amount of damage and sometimes you need to waste a considerable amount of ammunition to take them down, especially when they duck and doge. They actually response quite well to the player as do their bodies when you lay that ammunition into them. If things get too close and personal, you do have a melee attack but the catch behind Rage is the wingstick which is like a boomerang and dispatches your enemies just as easily as you do with a gun. Without spoiling the story, there is a great scene in the game where your character first learns about the wingstick from one of the local inhabitants. Health is integral to combat and fortunately there are plenty of healing items in this post apocalyptic to use at your disposal, not to mention scrap material that must also be collected to be sold or used for other items. When your not blowing enemy brains or sinew all over the ground, you'll be spending a healthy amount of time driving vehicles. Apart from assisting you get from point A to B, vehicles are also used in combat, especially against bandits that can sometimes prove a challenge. Vehicles don't last forever either and if you take too much damage, they are prone to blowing up. Vehicles can be repaired and you can even call for a tow from one of the local towns... for a cost. The vehicle upgrade system adds an element of fun as you attempt to mod it out for that additional power, especially when you become involved in a race. Racing is fun in the single-player mode, however for that additional challenge, online (Road Rage) is where all the fun and difficulty is. This is a combination of demolition derbies meets Mad Max as cars are maxed out and weaponed to assist the driver with their victory. However if cars are not your thing, the game does support two player cooperative missions that nicely expand the single-player game and gives XBox Live fans something to compete against... not to mention the other modes as well. 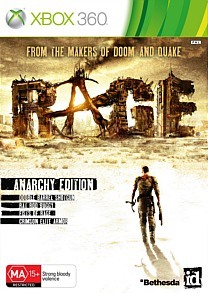 As mentioned, Rage is an impressive game on the XBox 360 with some delicious attention to detail that really pushes this console from its realistic clouds, lighting and post apocalyptic gaming environments. Did I mention 60 frames per second? you betcha! I also love the introduction of gibbs! Bring on Doom 4! Character animations is first class and whether it's the mad dashes that the mutants do towards you or the friendly inhabitants of the city, it's quite easy to get lost in this colourful world. Voice acting is quite professional (usually) and the sound effects really buzz through your surround sound system to help with the illusion. My only gripe is that the soundtrack seems a little lacklustre and needed something a little more heavy or inspirational as opposed to just another ambient musical score. In the end, iD have come back with gusto and their latest game Rage is definitely a keeper. 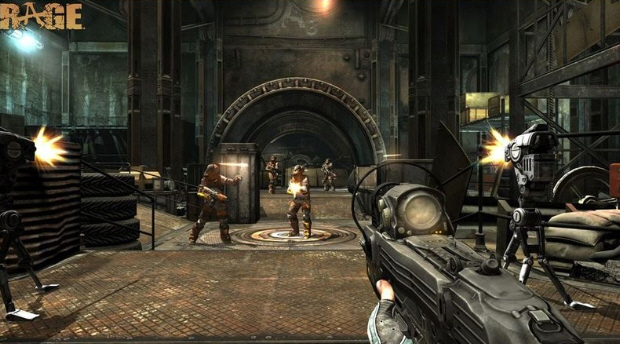 The developers have streamlined the gaming mechanics to really make this game flow as opposed to the stop starting of many similar first person shooters. With 20+ hours of gameplay available in the single-player and lots of online fun, Rage is a must play game if you enjoy this genre or those games from iD. Grab your dog and your shotgun and start exploring as you save the world. It's old school game meets the 21 century!